Swing Trading Blog | When is a Profitable Trade Considered a Bad Trade? When is a Profitable Trade Considered a Bad Trade? Have you ever looked back at a trade and thought, "I broke my rules and should have never traded that stock."? This stock immediately jumped out at me and I just had to trade it. Here you have a T-30, an engulfing candle, and a possible gap fill. There is a lot of pain being felt with this stock - on both the long and short side. Those that bought near the top, before the gap, are now stuck in a losing trade. Those that shorted the stock are now nervous because of the hammer! 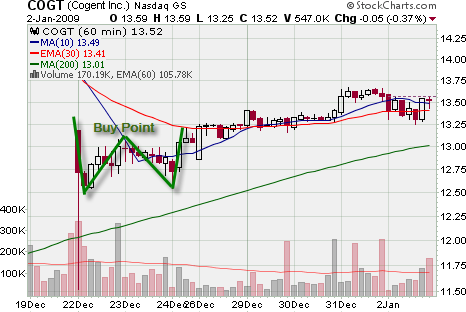 So, I bought the stock at the breakout above the middle part of the 'W'. Knowing that I was going to go out of town for a few days, I sold the stock a couple of days later. I hate to have to open positions when I'm on vacation because I don't want to have to worry about them. I should have just put in a stop loss order and left it alone (mistake #2). You can see on the chart below that I could have squeezed a little bit more of a profit out of this trade. And if I were trailing my stops off the hourly chart, I would still be in this trade. So, even though this trade was profitable, I will still consider this to be a bad trade. There is no point in having rules if you break them. 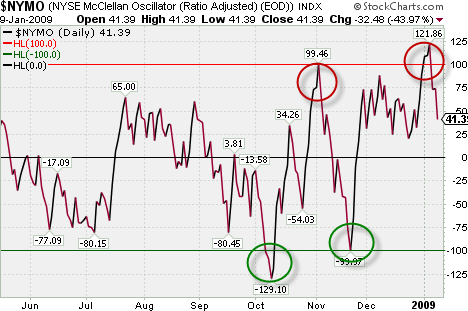 Do you watch the McClellan Oscillator? This is one of those charts that I look at from time to time. Like the VIX, it does a pretty good job of identifying market extremes. Not bad. Lately, the best signals seem to come when the McClellan Oscillator gets near that +100 or -100 level. One thing is for sure. I certainly wouldn't want to be betting against it! 5 Period Moving Average Exit Strategy. I'm Confused. I recently bought the book, Short Term Trading Strategies That Work by Larry Connors. It is a fantastic book and I definitely recommend it. On the long side, buy pullbacks and exit the stock the first time it closes above the 5 period moving average. On the short side, short rallies and exit the trade the first time it closes below the 5 period moving average. Well it is simple but this type of exit makes no sense to me. It seems to me that you would be leaving a lot of money on the table if you actually followed this strategy. Let's look at an example of an actual trade that they took. 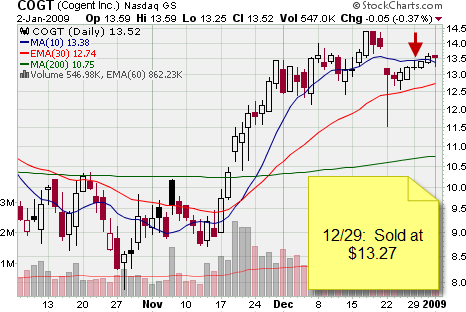 By December 31, we were short three units in EWJ (a full position for us). 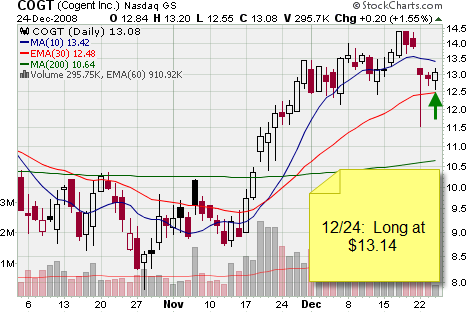 In EWJ, this exit strategy allowed us to cover our short trade on the fifth of January. That is the green arrow on the chart above. 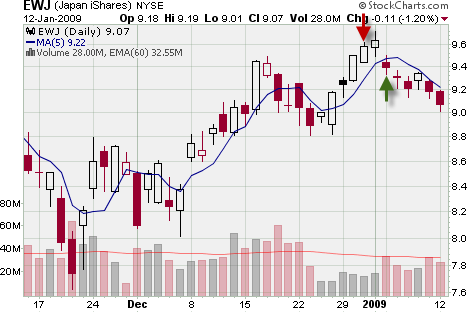 The stock closed below the 5 period moving average and that gave them the signal to cover their shares. Huh? Doesn't this seem like a premature exit strategy? Am I missing something? I mean, they covered their short position at the very beginning of the swing. Right when it was just getting started! I had to go back and re-read that section in the book to verify that I was reading it correctly. I am not trying to be critical. I very much like the idea of using a moving average for exits. So then I got to thinking about it and I thought, "Why wouldn't you wait for a close above the 5 period moving average". You would still be short this stock since there hasn't been a close above it yet. 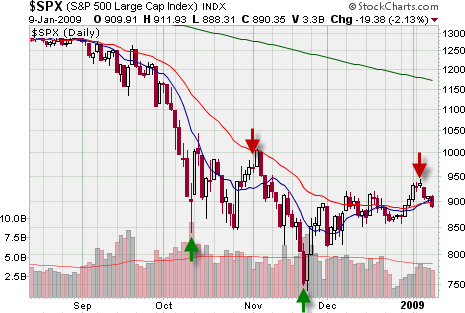 And on the long side, you would buy pullbacks and wait for a close below the 5 period moving average. That makes more sense to me.